Nice, I've also got Sane, got him on a free in the 5th season, this was his debut. Just reached the mid point in the third season and so far things are going well. 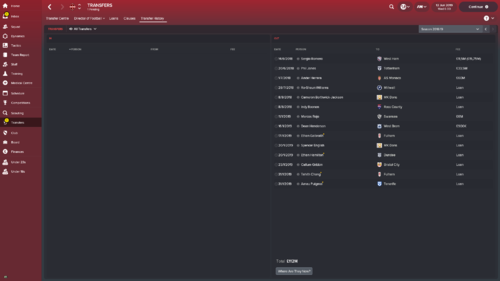 As always the season began with some transfer dealings in and out. Having won the treble last year I was happy with my squad and wasn't looking to spend too big, I needed a new right back as Valencia is starting to get on and Darmian just did not give enough quality going forward. In the end young German prospect Felix Passlack was the player purchased for £67m from Borussia Dortmand. Two more players were added to the squad. Wayne Rooney returned for his second spell at the club a £240K buy from Everton to add some experience to a very young squad. He won't play much but can do a job in a few positions and has great passion for the game. Finally Joe Hart arrived on a free transfer having left Manchester City. I couldn't pass up having an international quality keeper as back up to De Gea especially with there being no fee. Players out were Joel Periera £5.5m - Celtic, Sergio Romero £6.5m Besiktas, Mateo Darmian - £17, AC Milan and Juan Mata - £52m Real Madrid. August began as has become customary for us with victory in the Community Shield against Liverpool on penalties following a 1-1 draw. 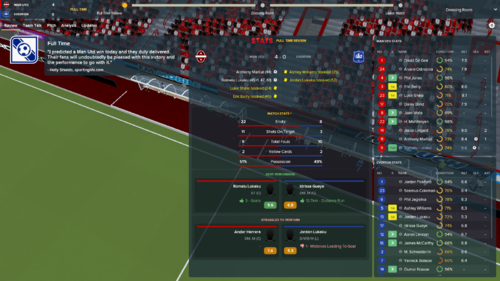 Next up was the European Super Cup and for the second year running we lost out in the this match going down 3-2 to Chelsea. In the league we began with victories over Stoke and Tottenham before finishing off with a 2-2 draw at Stamford bridge. September brought with it the start of the cup competitions and with it a stunning performance in Europe. 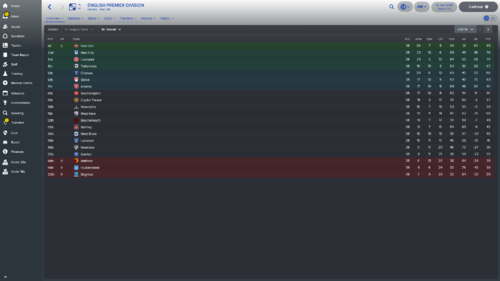 We were drawn in a fairly easy group alongside Napoli, Leverkausen and Lech. 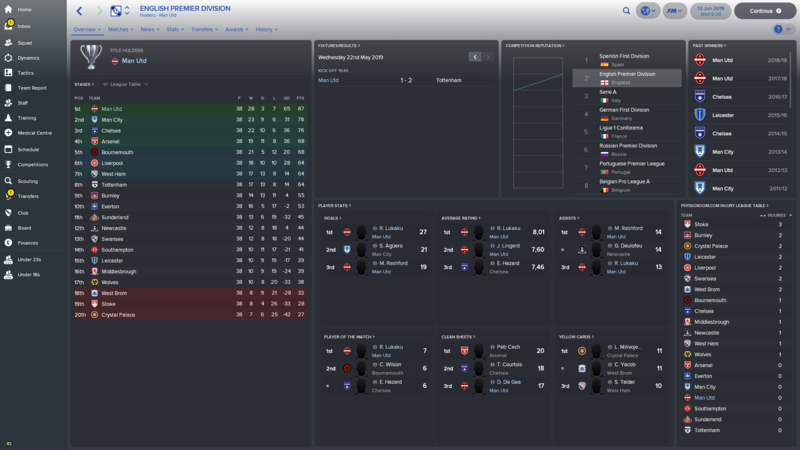 we began in Europe this month with an 8-0 thrashing of Lech on match day one. The Carabao Cup also began a 3-2 win over Hull in which we continued to blood youngster giving them a taste of first time action. In the league we had victories over Man City and Arsenal either side of a 3-3 draw with West Ham. October began with the visit of Napoli and a 5-2 win, this was followed a few days later by our only defeat of the season so far a 1-0 loss at Newcastle in a game we dominated and should have won easily, We played two more league matches this month winning both 1-0 over Liverpool and 3-0 over Palace. 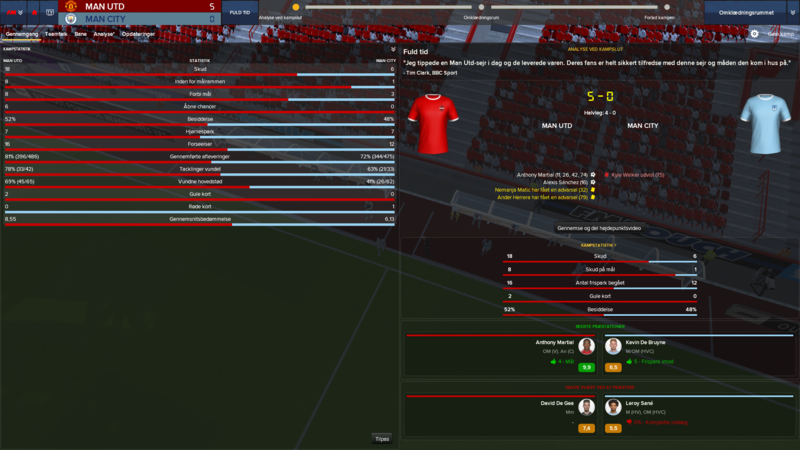 In Europe a 3-3 draw with Leverkausen left us in strong position to qualify and Rotheram were dispatched 4-0 in the Caraboa. November was a busy month as we finished off the ECL group stage and went undefeated in the league. 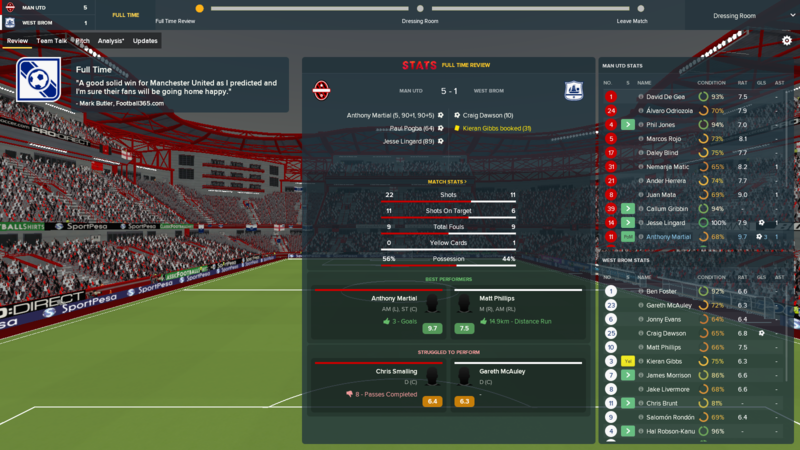 First up was a 3-0 win over Palace, this was followed by a dramatic 4-3 win away at Watford having been 3-0 and a Man down at half time Lukaku entered the fray and was sensational.Victories over Leicester and Bournemouth followed. 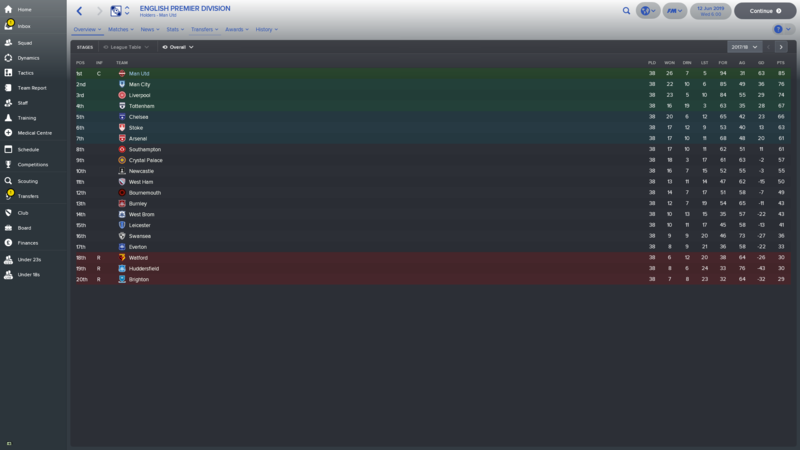 In Europe victories over Leverkausen and Lech sent us through top with a game to spare. Going into the second half of the Season we have a quarter final match against Spurs in the Carabao cuo to look forward to, A tough match up against Juventus in the ECL. In the League we sit 8 points behind City but with 3 games in hand. On the injury front Axel Tuanzabe has been out for most of the season with a cruciate ligament injury sustained in August. Over long term absentees are De Gea with a torn calf suffered in November he will be out for around 3 months and Aliou Traore with a a torn Abdominal muscle for 4 months. Anthony Martial was rewarded for his fine form winning the world golden ball and finishing second to Cristiano Ronaldo in the world player of the year. Now looking forward to the second half of the season and further success. We play on Control with a Fluid mentality and TI’s Higher Tempo, Play Wide, High Defensive Line, Prevent short GK distribution, Play out of Defence, Exploit both flanks, Pass into Space, Mixed Directness, Be MoRe Expressive, Look for Overlap and Work Ball into Box. I’m tempted to add a PI to the strikers Close down More so we Press from the front, same with Lukaku as a TM(S) and Rashford as a AF(A) of CF(A). Any tips on signing and tactics would be greatly appreciated. Playing Structured over Fluid would add the stability you'd want. Playing a high line without a DM can be risky with teams playing long balls with catch the defence on the back foot of tracking back to recover possession. 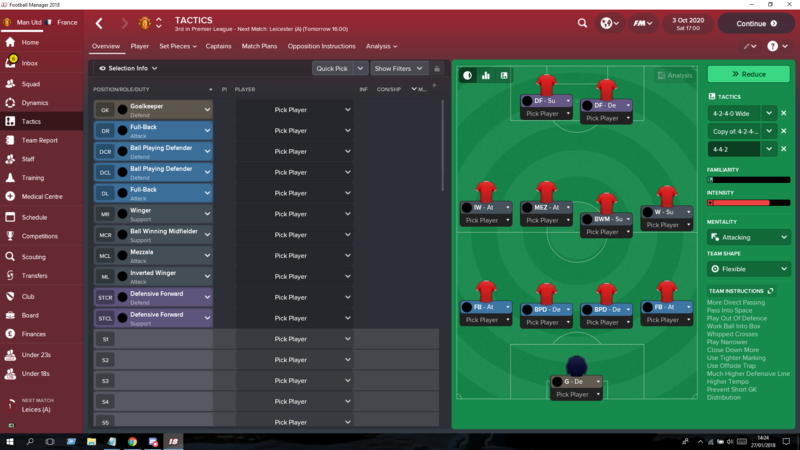 When I've made a 4-4-2 tactic just stuck to the normal tempo, wouldn't worry about working ball in to the box unless you want to play possession football as high as what Manchester City have been doing in real life. Too late, signed Ben Gibson. I also added Milik to add a bit of a spark to free up Lukaku to poach goals. The supercoppa went dreadful, loosing 1-0 and it should’ve been more. The positive is that we made some decent chances, Real were just devastating in the counter, even when dropping deeper so Ronaldo wasn’t running in behind. I may well stop looking to control games and just attack teams, I can drop deeper or try a 433 which would be impractical now I have signed Milik. I want a team that plays a fast, attacking brand of football so I don’t really get why I’m on control, I will create a 433 tactic next time just to have a feeler as to what I can do but the 442 is what I want to create. Just beat Manchester City with Counter Attack at its finest! Didn't expect to get a win a draw would have taken from it. Was then in the process of taking Martial off with numerous mistakes and a rating of 6.1 but then scores and goes to almost an 8.0. Stopped City's lead at the top of the table drop from 5 points clear to just 2 points after this result. 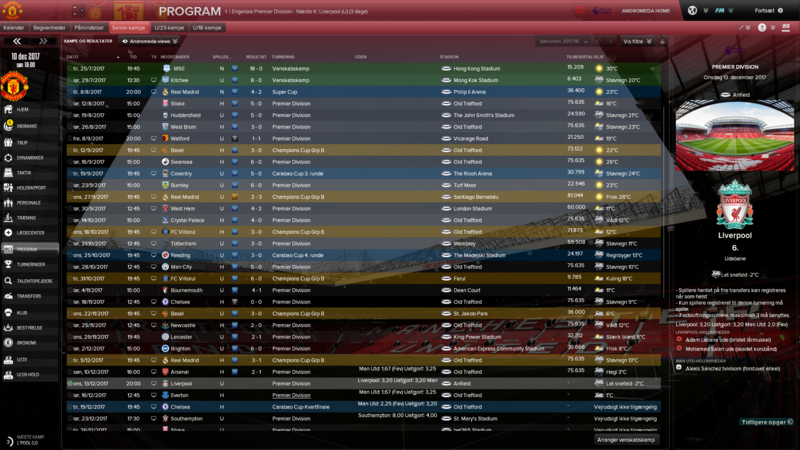 Liverpool are as good on FM as they are in real life lol. 3/4 big teams defeated. I struggle to beat them and chelsea for some reason. We just visited Anfield in a top of the table clash with them having won their first 10 league games of the season. After 11 games it's turning into a 3 horse race. Wondered how long it would take for him to come to me about this interest from Barcelona. Anyone managed to keep him at the club? Don't want to lose him half way through the season. Yea I’m in the 5th season and martial is still with me and has been class, just got runner up for world player of the year. He always has interest from Barca or Psg on mine but been quite easy to keep him. I must of got lucky as never had to promise him anything. I brought Dybala in in the 3rd season for 120mil, he is unbelievable, and he actually won the world player of the year in the 5th season, with martial runner up. He just has everything. Yea dybala must be the most complete forward on the game, it’s the 1st time I’ve brought him on fm. I sold lukaku after the 4th season, he had been decent for me but nothing special, and with martial dybala and rashford all performing, he just weren’t gonna play. He claimed was because he could grow as a player, playing with better players than we have. Can't really describe how good Martial is. He's a monster, feel like I have Cristiano Ronaldo in my team at times. 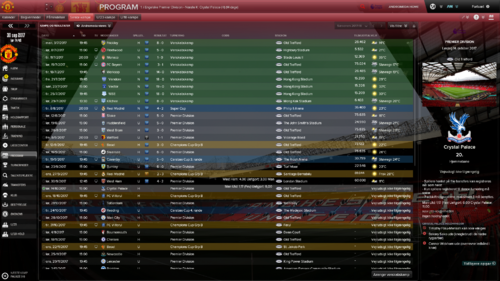 Finally managed leap frog Manchester City!! Thanks to Watford defeating them in the latest match! Any one got any ideas of getting Lukaku scoring he's managed just 7 in 25 apps overall in December kinda hoping for a different player to come into the new year!! 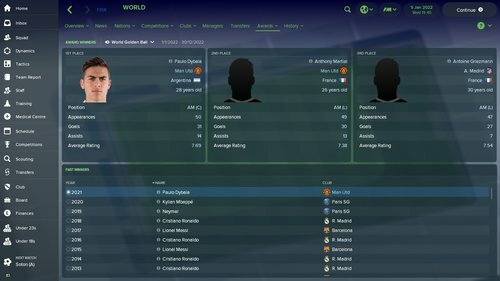 So after Dybala was robbed of the world player of the year in the 4th season, he finally won it in the 5th. 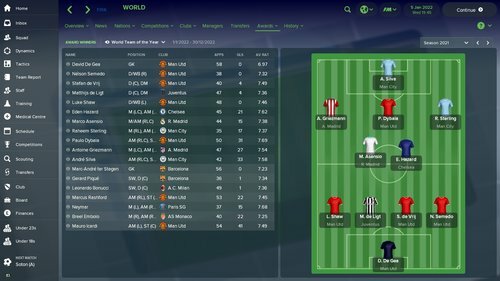 We also had a few players in the world team of the year, with De Gea and 3 of the back 4 showing how good how defence has been. Here's how the table looks so far in season 5, city's title defence has fallen apart but am in a good battle with aresnal and chelsea. Icardi is top goal scorer, but he's abit of a strange player he doesn't do anything special or have amazing games, but just keeps picking up a goal a game, and solid 7.5-7.6 ratings. Gribbin has been excellent and is top of the average rating, Sane has been a great free transfer and Dybala has just been class. Same for me with Lukaku, he scored in spells and had quite a few non scoring games, he had a good 1st season but the 2nd and 3rd season he kept picking up small annoying injuries and missing games, so got fed up and ended up getting 95 mil for him after from Madrid. I've had Dybala and Rashford playing up top, but ended up getting a replacement for Lukaku bringing in Icardi so have a pretty handy strike force, with Martial chipping in as well. I started a Manchester United save last night, with a transfer data update, just to get going on FM18 as I’ve not played it yet (due to a broken computer), but now I’m set up ready to go, but not yet got involved much with the new dynamics, scouting and stuff. 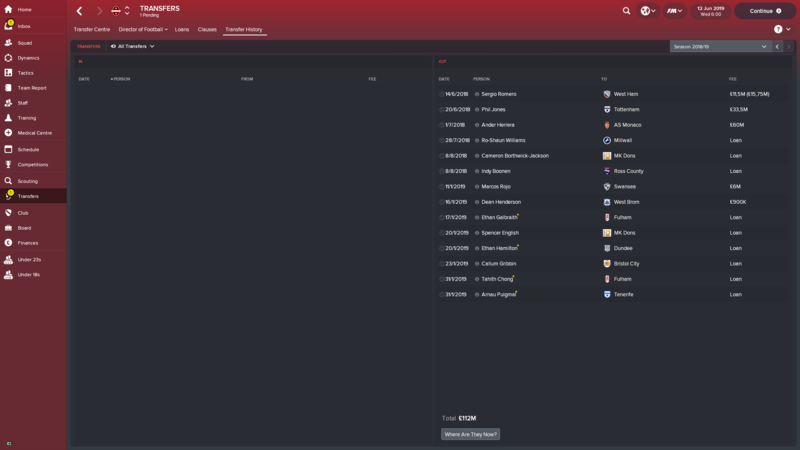 I’ve started with no transfers in the first window. 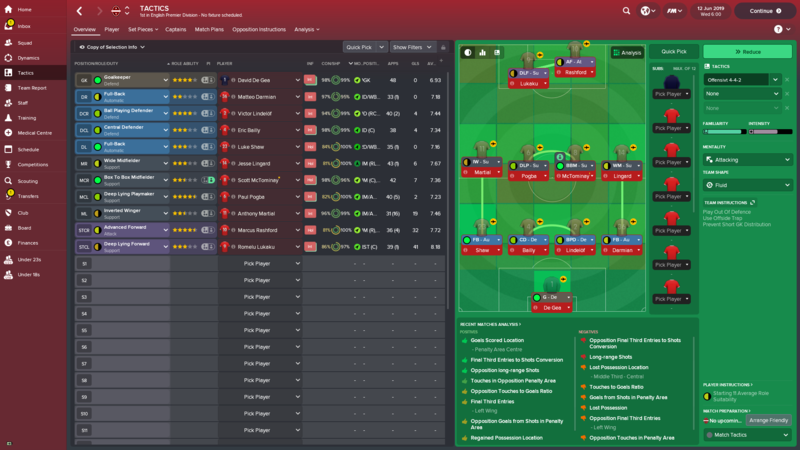 Anyway, I didn’t really get round to much, spent a few hours setting up the tactic, training and individual training whilst also overhauling the coaching set up as far as I can currently go. I’ve pushed my scouting set up to the highest level too. 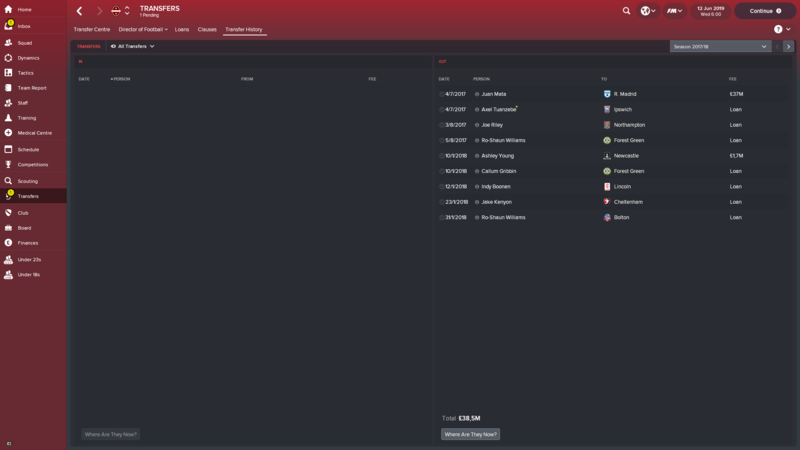 I’ve also arranged all the new contracts on players and staff so all I need to do now is work through 9 pre-season friendlies, trying to get the tactic to settle in, ready for Real Madrid in the Super Cup. Looking forward to using Alexi Sanchez, behind Romalu Lukaku. My aim for the save is to try and bring through some youth players (Gribbin, Angel Gomes look particularly good) , building up the youth and reserve teams whilst signing elite players, where possible. The Season continued in January it was a slow transfer window with no in coming players and only one departure as Mesut Ozil left to join PSG for £46m a very nice return on a player who had cost us nothing only 18 months prior. Back in the action the month began with the final of the CWC a resounding 5-0 over Cruz Azul. Cup competitions were also prominent within the month with both the quarter and Semi finals of the Carabao Cup, the quarter final saw us triumph 3-1 over Spurs after extra time before moving on to a two legged tie with Arsenal. 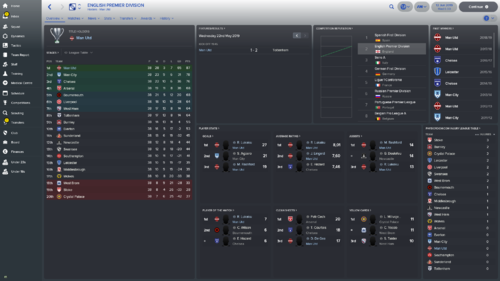 A brilliant 5-1 victory in leg one practically moved us into the final before we completed in the job with a 2-1 win away at the Emirates. 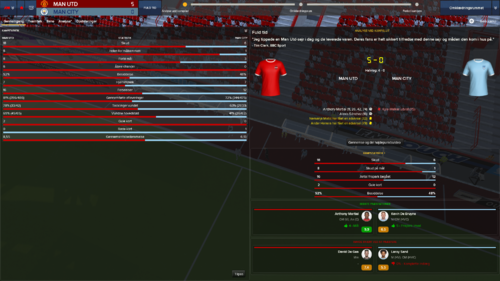 The FA cup 3rd round also took place a 2-0 win over Fleetwood Town. In the league victories over Chelsea and Swansea sat alongside 1-1 draws with both City and Stoke. February began with a 1-0 win over Norwich in the FA Cup. 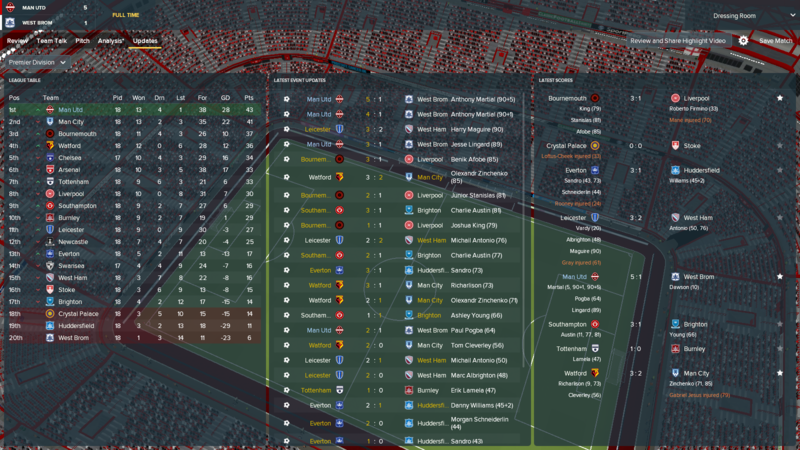 In the title race we went though the month with a 100% record a 4-3 win over Arsenal the Emirates the highlight. 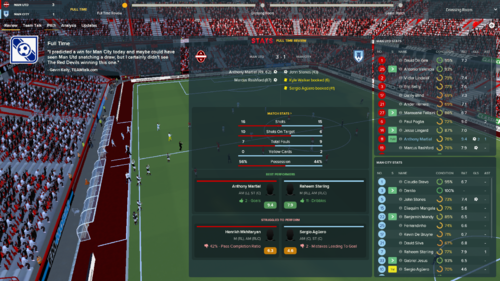 European football also restarted with a tough on paper match up against Juve, however a 4-0 away victory in leg one set us up perfectly. 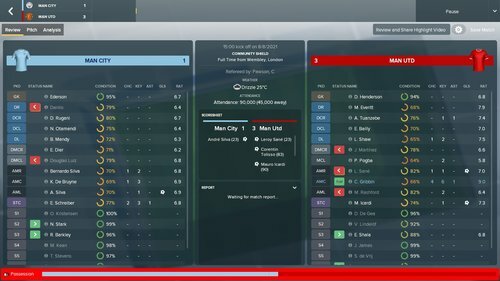 In the FA Cup we threw away a 2-0 lead against City to draw 2-2 and have to settle for a replay. Our first appearance in the Carabao Cup final began our March a 2-0 victory over Aston Villa giving us ownership of the only piece of domestic silverware not in our cabinet since I took charge. 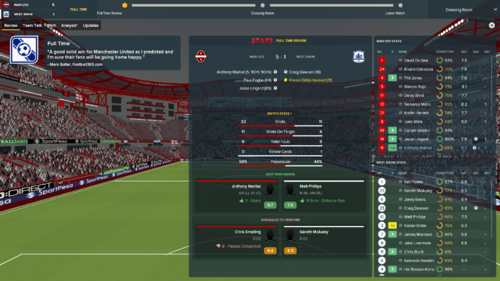 This match was immediately followed by the FA Cup replay with City, once again over 120 minutes there was no separating the teams, this time a 3-3 draw before we emerged victorious on penalties with City missing every one of their kicks. Once again we went through the league 100% with wins over Liverpool, Palace, Huddersfield and Watford. The ECL second leg with Juve finished 3-2 meaning a 7-2 aggregate win. 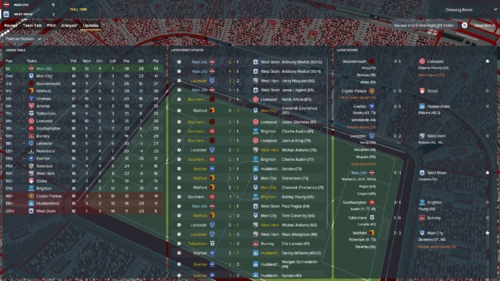 Finally the FA Cup 6th round saw a 3-0 win over Chelsea. 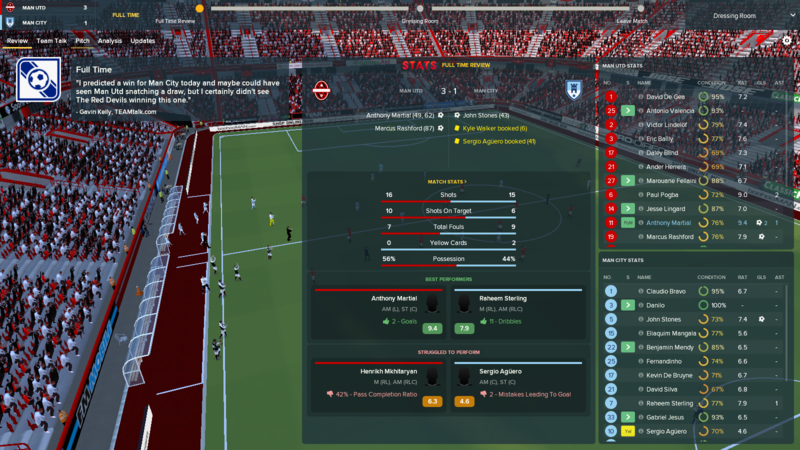 An all domestic ECL quarter final with Chelsea was the highlight of the month of April a 3-0 win in leg one followed by a 4-3 win away in the second leg moved us on in search of a hat-trick of ECL wins. Only a 1-1 draw with Leicester blemished an other wise perfect month in the league. 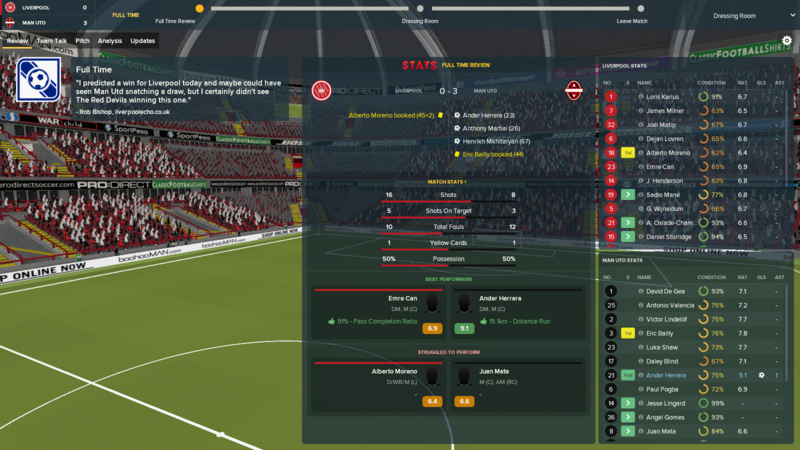 An FA cup semi with Bournemouth finished 3-2 in our favour. 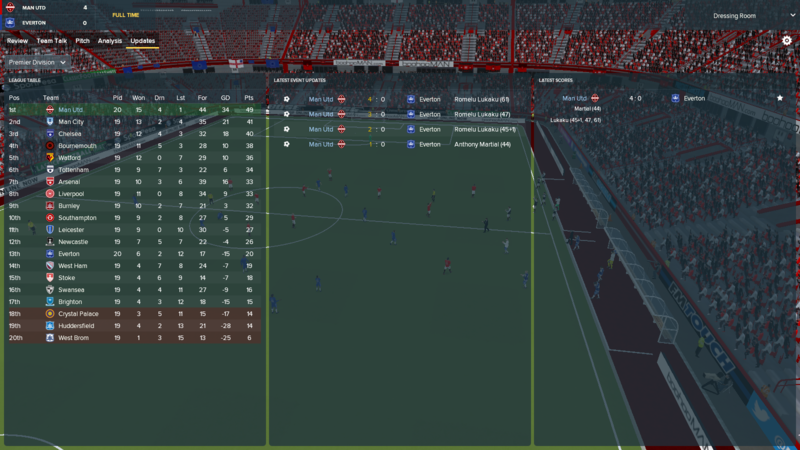 Finally another excellent first leg performance moved us within touching distance of the final a 3-0 win over Dortmund. 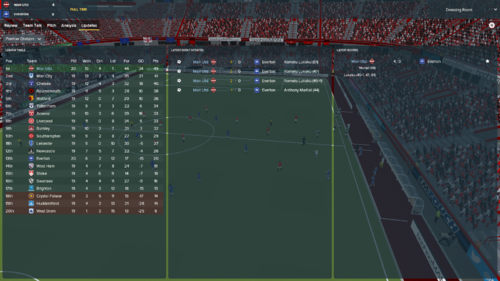 Finally to the month of May with the league wrapped up with a 2-0 win over West Brom we were able to move onto the cup competitions with mixed results a 3-2 win over Huddersfield in the FA Cup before we were dismantled by Barcelona in the ECL final 3-1. A much busier transfer window for us than the last few years with a number of players both in and out. Leaving the club were Henrik Mkhitarayan - Real Madrid - £56m he had been one of our best players over the past three years but the offer was too good to turn down. Joining him in moving to Madrid was Victor Lindelof for £81m I hadn't planned on selling him but the fee was just too good. 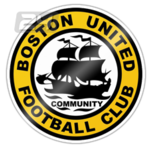 Joining them on the move away from the club were Cameron Borthwick-Jackson, Ro-Shaun Williams and Dean Henderson for fees of £2.7m, £350K and 750K respectively. 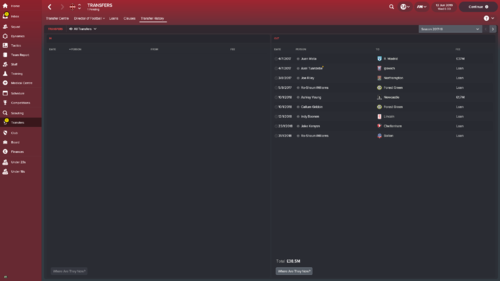 The loss of two loss of two major stars of the first three seasons left some gaps in the squad so for the first time since taking over we spent big first in was Matthijs de Ligt for £46m from AS Monaco. 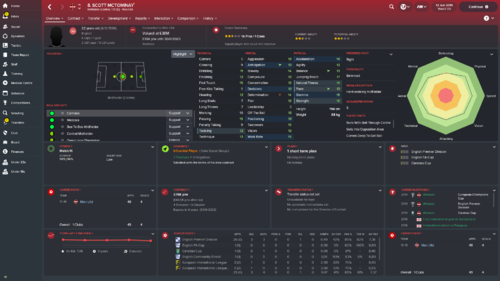 Next to arrive was Jamaican star Leon Bailey from Leverkausen for £46.5m. The spending was completed with the signing of Italian starlit Federico Chiesa for £20.5m from Fiorentina. Finally Erik Lamela signed on a free transfer after being released by Tottenham to add some experience and creativity to the squad. Federico Chiesa on my save. Now that's a way to perform and finally get on the scoresheet! Even better being previous club! Now that's painful to even attempt to read let alone sit there and read it. Why so small on font? Finally after 6 seasons, a youth prospect with some serious world class potential, starting his tutoring with Saul and will follow that with Dele Ali and Arthur, fastracking this kid straight into the 1st team squad. 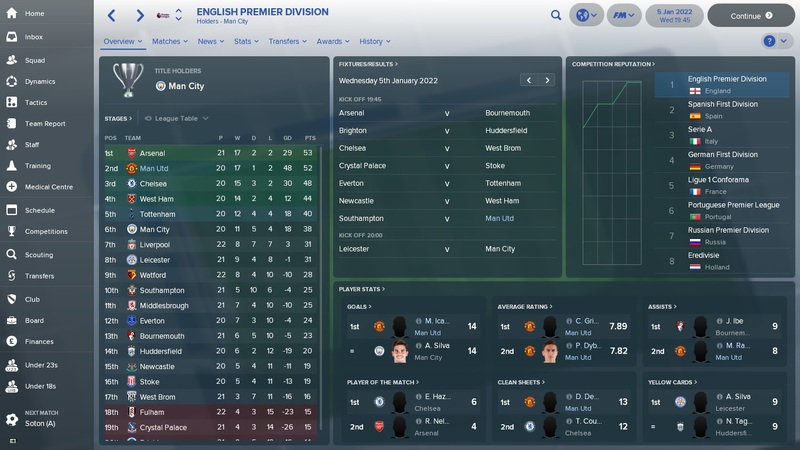 Ended up going for a strikerless 4-2-4 and swept all before me, winning the League, FA Cup, Champions League and League Cup. 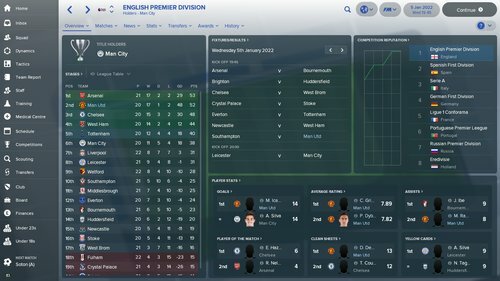 So I have decided to stop my man utd save for now, I plan to start a new one in a few weeks either once the jan transfer update is out or when I want to download an update so I can start with Sanchez, he was at man city on mine and it was annoying me, plus there are a few things I want to do differently. 1. I dropped the ball with a couple youngsters mainly Gomes, which I want to correct. 2. 1 or 2 players I sold I really regretted, Jones and Herrera being the 2, so will keep them next time. 3. Couple players I brought stunted the growth of some players slightly, Davies at left back being the main one, as I didn't play Shaw much for the 1st 2 seasons then when he became no 1 left back in the 3rd season onwards he was easily one of the my best players. But we had a good 4 and half seasons winning 2 league titles, 1 champs league, 3 fa cups and 1 league cup (won in the 5th season). Also if want to count them 2 community shields, 2 super cups and 1 club world championship. 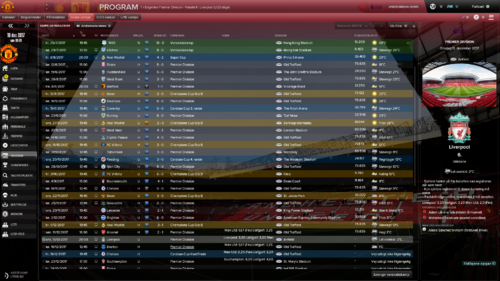 I'm going to do a quick 2 or 3 season save with Lyon then come back and start a new man utd save. 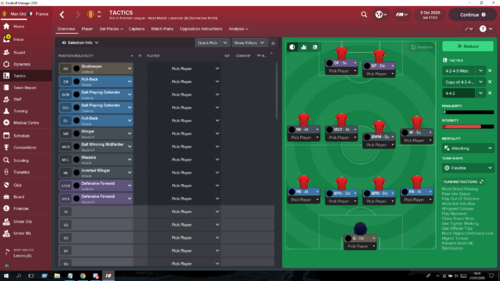 Hey guys, I'm looking to do the same as Sedge and start an new United save come the January update but I'll be looking at making a 4-4-2 / 4-2-4 (wingers higher up) but I've always struggled to get a tactic set up to actually work so if anyone has any advice that would be great. Converting one (or both!) of Martial or Rashford to be Left Midfielders is needed and you might need to sign a Right Mid as well, but aside from that you're sorted. No player instructions in this tactic, and with opposition instructions I tend to close down and mark tightly the spine of a team (GK, CB, DM, CM (- only close down), AM, ST) and set everyone with a weak foot of reasonable or below to show onto that foot. Well I was thinking of bringing in Lozano from PSV as a winger to play with Sanchez (not sure yet). 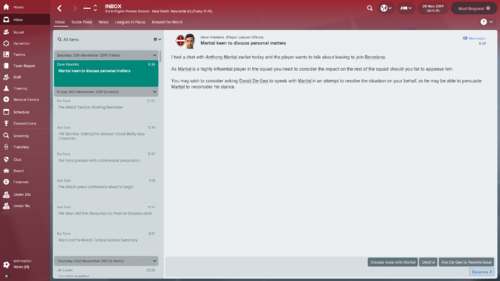 Then have martial and rashford rotating with one of the striker roles. kinda looking for a classic CFs and AF top two. I always find a CF/AF pairing don't do enough pressing for my liking. Defensive mistakes seem to be an area easily exploited in this year's game, hence the DFs, who do press and harass as much as I want.